Fibo Intercon helped construct a huge agricultural facility in Russia, with a total cost of 100 million Euros. 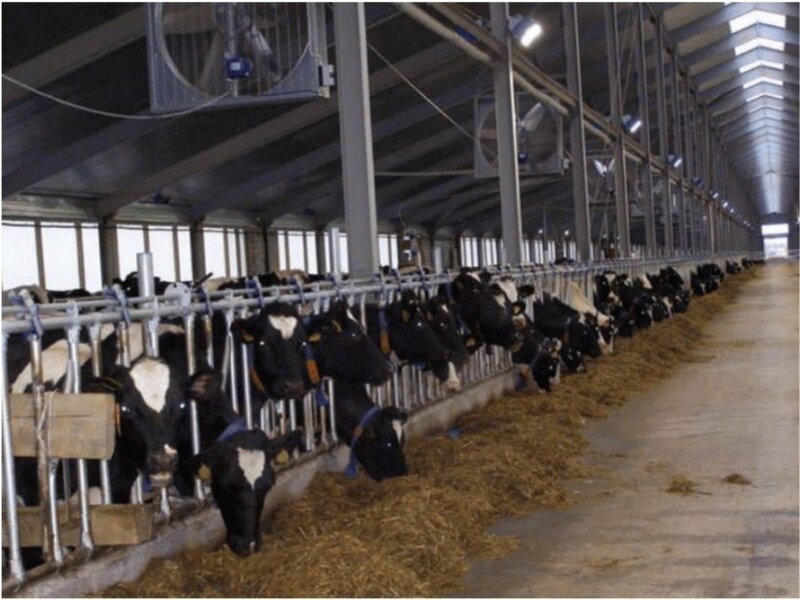 According to the Russian Presidential Program for the Improvement of Agriculture in Russia, there was a wish to construct a huge agricultural facility in the Borisoglebsk area of the Yaroslavl Region, specializing in milk production. The project involved the construction of seven dairy complexes, each for 2.400 dairy cows, and a milk processing plant with the capacity of 350 tons per day, on an area of about 100 hectares. This unique dairy complex is the largest in Europe, with a total cost of 6,4 billion rubles or 100 million euros. The project was constructed in the scope of a 3-party contract between the Yaroslavl Regional government, Borisoglebsk area administration and the Voschazhnikovo agricultural company. The main contractor selected a Fibo Intercon Batching Plant M2200 for the construction. The M2200 was chosen for reliability and the flexibility of the set up. Due to the very tight construction schedule, the plant was working in 3 shifts, 24 hours a day, for one whole year without any maintenance and cleaning. It is a testimony to how well Fibo Intercon’s equipment works – even in the most difficult circumstances. Due to the tight construction schedule, our service engineers were called to service the batching plant and equipment when the first facility was finished. Once our servicemen finished the job, the plant was in good working condition, despite the poor maintenance and absence of cleaning on the batching plant. The machine had produced 218.400 m3 of concrete before its first service. When the service engineers were finished, the batching plant was moved 1 km away and during the next year it constructed a second facility working 3 shifts, 24 hours a day. The fact that a Fibo Intercon plant does not need any foundation to be set up means great savings in moving and start-up times. This compact batching plant has a standard capacity of 25-45 M³/h. For production of stiff-mix concrete, a capacity of 45-60 M³/h is possible. The standard M2200 is delivered with an agitator pan mixer, 2 integrated twin hoppers for 2 x 2 types of aggregate, 2 x 2 separate feed belts, water supply, load cells, additive pump, high-pressure cleaner and dosing equipment and control unit for the batching computer. Fibo Intercon’s concrete batching plant is the best available on the market. It is a well thought out solution designed to provide optimum flexibility, performance and operating efficiency. Our concrete batching plants are designed and built to a very high standard, so will last more than fifteen years – this ensures a very high return on your investment. 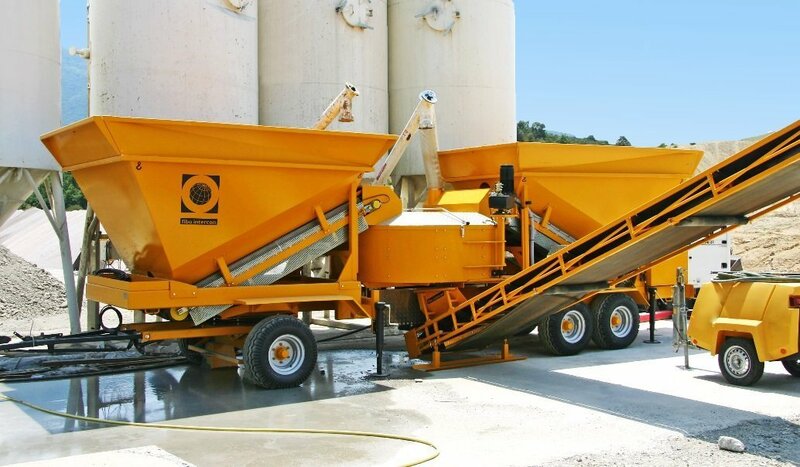 Fibo Intercon supply a large range of high-quality concrete batching plants with a dosing accuracy of +-3% for standard machines and +-1% for our pre-weighing machines. Below you can see a small selection of our standard machines which can be set up and ready to go within two hours.